Are you still knitting this summer? For some, their answer is YES and for many many others, it is not. This is the first year that I’m experiencing the knitting lull that many knitters get during the hot summer months. Our knit night group hardly meets anymore, and I haven’t touched any of the sweaters I started last winter. If I’m lucky, I’ll get a few rows on a lace or sock, but to be honest, I haven’t been doing much of that either. I’ve picked up a little bit of crocheting, but mainly I’ve spinning! There’s just something so refreshing about spinning out in my back yard when the cool breeze kicks in to temper the warm day. I live in the bay area and usually around 6pm you can open the windows and get a nice natural cool breeze that blows in from the bay. This is why it costs such an arm and a leg to live here… and I have to admit that I love it. 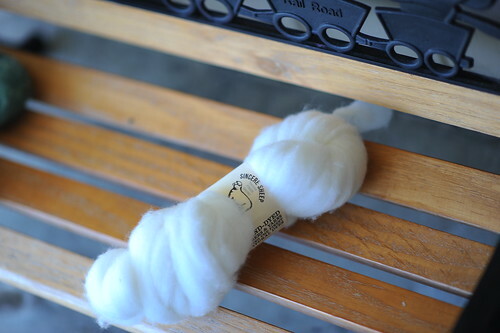 I got this super springy, soft, Cormo fiber from Sincere Sheep at CNCH earlier this year. I’ve never spun pin drafted roving before, and I’m really enjoying every minute of it. I’m spinning it worsted, which is new for me as well. I have so little left to go on this 4 oz bump. I can’t wait to ply it and then I have grand plans of actually dying it like Laylock (love her blog!) did and perhaps having it grow up to be something like this Ribbon of Breeze scarf by Sachiko Uemura. Now that I think about it, this is kind of the perfect fiber storm… spin in the spring / summer, knit up my handspun in the Fall and Winter. Fiber bliss all year long! 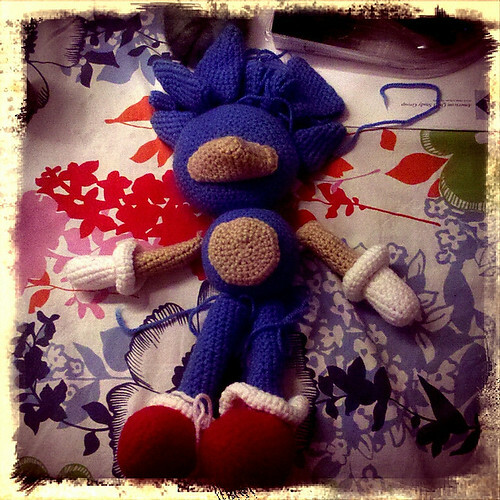 The pieces of sonic are finished, all except for the little black nose. They have been waiting to be sewn together for over 6 months now. For some reason I have been putting it off. I think I’m scared of it not turning out good. I have to cut out the felt eyes just right and sew it together in a way that is sturdy, but not obvious, and embroider the mouth. All of these things breath life into a stuffed animal and the slightest misplacement of an eye changes the whole personality. The hillarious thing is that I started this over a year ago when my DS was obssesed with sonic. Now he couldn’t care less. No matter though, I’m determined to finish this by next week!